During his creative peak in the 1980s, one of Woody Allen's greatest strengths was his ability to write complex and captivating female characters. It helped that most of them were played by the incomparable Mia Farrow, and their creative partnership produced some of the best work either has ever done; he wrote great characters and she brought them to sparkling life. After their relationship ended in 1992, Allen still seemed capable of writing great roles for actresses, but they became less varied, falling into a handful of archetypes that could be enlivened by great performances - such as a never better Mira Sorvino in Mighty Aphrodite - but they were also flatter and less alive than many of his best. His latest, Blue Jasmine, marks a startling reversal of the trend, offering one of his most complicated characters and one of the best performances of Cate Blanchett's career. Jasmine (Blanchett) is a New York socialite who, following the death of her Bernie Madoff-esque husband (Alec Baldwin) travels to San Francisco to stay with her sister Ginger (Sally Hawkins) and her boyfriend (Bobby Cannavale) while trying to put her life back together. A woman used to conspicuous wealth and privilege, the need to hold down a job proves daunting to Jasmine, and she quickly decides that her salvation will come in the form of a diplomat (Peter Sarsgaard) who falls for her. Needless to say, her attempts to maintain a grip on her fragile emotional state makes her obsessive pursuit of a new life somewhat difficult. Trying to talk about Blue Jasmine without talking at length about Cate Blanchett would be like going to Giza and ignoring the pyramids. It's such a colossal achievement that it overshadows everything else around it. From the opening scene, in which we see Jasmine describing her life story to a woman on her flight to the West Coast, it is readily apparent that Jasmine is a raging narcissist who relates to people only in terms of how much they can help her get what she wants. She speaks at length and eloquently on a number of subjects, but never more so than when she can talk about herself. Yet there is also a well of sadness underpinning her solipsism; Jasmine is not merely a woman on the verge of a nervous breakdown, but a woman on the other side of a nervous breakdown, desperately trying to crawl back to something resembling normalcy. There's a fabulous tension throughout the film, a sense that at any moment Jasmine could explode like a powder keg, destroying everything around her, and Allen exploits this uncertainty for all it's worth. Nowhere is this better illustrated than a scene in which Jasmine takes Ginger's kids out for pizza. After they ask her with childlike inquisitiveness about what happened to her back in New York, Blanchett delivers a beautifully crafted monologue that takes Jasmine from light whimsy to a woman scorned to a bundle of rage and back again using nothing more than a slight change in her tone and the angle of her head. It's a standout moment from a bravura performance that distills what makes Jasmine such a fascinating character; she is both participant in and author of her own story. She constantly reshapes her life story and deludes herself into believing that she is a victim of circumstance. As the story progresses and more details of her life are sketched in by Allen's typically digressive storytelling, it becomes more and more apparent that this is not the case. The great triumph of Blanchett's performance is that she manages to make Jasmine sympathetic - or at least pitiable - while never letting us forget for a moment that she is a poisonous character who ruins the lives of everyone around her merely by being close to them. We see this not only once she arrives in San Francisco, but also in flashbacks to her life in New York where she inadvertently bankrupts Ginger and her former husband Augie (Andrew "Dice" Clay) merely by bringing them into the orbit of her husband. Once she moves in with Ginger, that pattern quickly reasserts itself as she accidentally pushes her into the arms of Al (Louis C.K. ), a man whose easy charm can only lead to trouble. Yet we still want something good for Jasmine, even if it is something as simple as her taking steps towards being a better person, as unlikely as that might seem. As great as Blanchett is - and it should be abundantly clear at this point that she is amazing - everyone around her does great work as well. Sally Hawkins is as adorable and brittle as ever, Louis C.K. and Bobby Cannavale are hugely charismatic and Alec Baldwin does fine work illustrating just why Jasmine and the entire world fell for his character. The surprise standout of the supporting cast is easily Andrew "Dice" Clay, who puts his rough, blue collar persona to great use as the closest thing the film has to a conscience, something which you might not expect given that he's exactly the sort of character that Allen likes to make fun of. 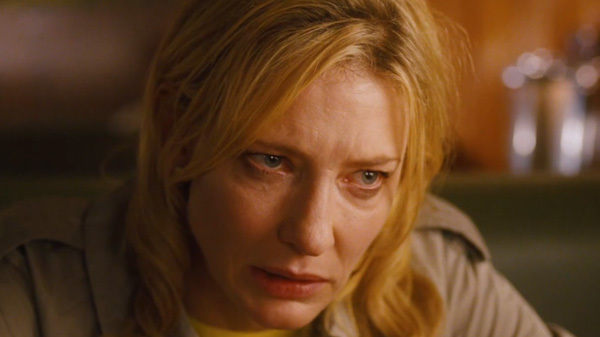 In short, while it might be a showcase for its lead, Blue Jasmine is far from a one woman show. It would be easy to dismiss Blue Jasmine as a film that serves only as a vehicle for a performance, but that would give short shrift to just how great that performance is. Alternately wryly funny and heartbreaking, it's one of Allen's most textured and nuanced films in years, a compelling character study driven by fear, greed and delusion. It's A Streetcar Named Desire with less compassion and humidity and it's utterly wonderful.